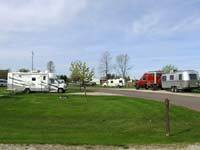 Ashland, gateway to the Bayfield Peninsula, is about 42 miles west of Hurley/Ironwood on US Highway 2. Travelers coming from the east can go the direct route through Odanah, and perhaps stop at the Bad River Casino. As most of the lake is not in view along this route, those not on a time schedule will find a Fall color side trip worthwhile. 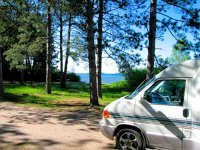 Our recommended alternative is a waterfall side trip tour (south on Highway 169), stopping at Potato Falls and then on to Copper Falls State Park, near Mellen, WI. After visting Copper Falls near Mellen, take Highway 13 north to Ashland and return to the regular Circle Tour route. You pick up Highway G, about a mile west of the intersection of Hwy 2 and Hwy 13, West of Ashland. It runs roughly parallel to US Highway 2 for about 10 miles where it rejoins Hwy 2. It is a nice little drive both for its scenery and for the fact you can poke along enjoying the ride and views w/o traffic. Vibrant fall colors also at Ashland's Chequamegon Bay Golf Course. 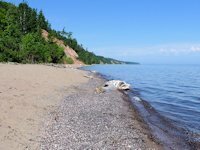 The picture at the top of this page of the Old Fishing Village was taken along the section of the Waterfront Trail that runs from the Kreher RV lakefront campground east to Bayview Park. It is a nice little walk during fall color time. To the right is a photo of one of the old fishing camps in this village that has seen better days. Former resident Andrea Logan wrote to share some tidbits about the "Fishing Village." The boathouse pictured above was the former home of an old-timer named "Bruno" who worked at the old paper mill. She remembers seeing her first Packer game on Bruno's TV. She also says that the cove formerly held many more boathouses than shown in the picture at the top of the page. What remains were those that survived the storm that claimed the Edmund Fitzgerald. Andrea says she enjoyed both swimming and ice fishing in the cove and she and her friends could walk out on the sandy bottom for almost a mile before the depth was over their heads. 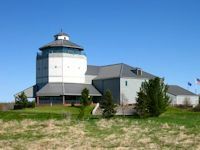 Located about 2 miles west of Ashland, just past the Highway 13 turnoff, the Northern Great Lakes Visitor Center is one of our favorite stops for the panoramic view from their observation deck, the interesting exhibits on the Lake and the history of the area, and the boardwalk nature trails. 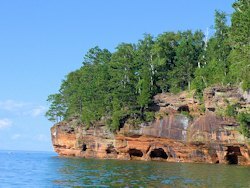 The Center's multimedia theatre offers programs on the Apostle Islands and weekly movies. There is also a gift shop/bookstore and a historical archives research center. Free Admission. 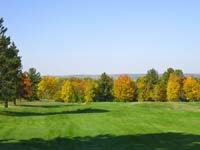 Some years AppleFest weekend coincides with good fall color. One year we rolled into town late Sunday afternoon about an hour before the official end of the festival. Weather was sunny with a crisp wind off the lake keeping jackets buttoned up. We caught some apple brats, got some OctoberFest beer, and enjoyed the ambience of the campfire at Greunke's (aka Gruenkes) outdoor beer garden. Later we took a drive in the country and caught some nice fall color. A nice day trip color tour loop. Take Hwy 13 north out of Ashland to Bayfield . . . then a short side trip detour to Little Sand Bay (via Hwy H). . . return to Hwy 13 and stop at Meyers Beach . . . then continue on to Cornucopia . . . In Cornie, take County C south out of town, traveling through the high country of the Bayfield Peninsula, eventually returning to Hwy 13 at Washburn. 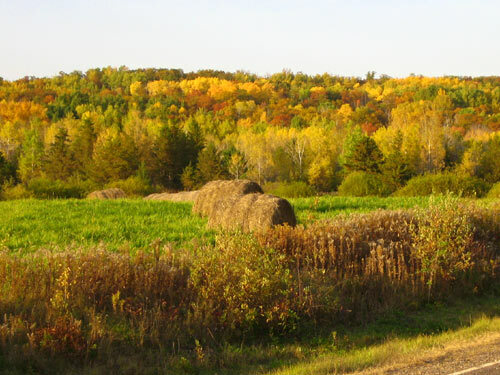 Fall Color Reports for Wisconsin, Minnesota, and Michigan Upper Peninsula regions around Lake Superior.